Second assignment for The Future of Storytelling – MOOC is to choose a main character from a television show and create a character profile. This was a fantastic assignment for me. As most of you know I watch too much television for my own good. So, I had a really hard time making a decision. There are just so many to choose from. Do I go classic and choose Sydney Bristow from ALIAS, or do I go more modern and choose Neal Caffrey from White Collar. It was a difficult decision, but I chose to reveal it in an infographic. Hope if makes sense to you all. 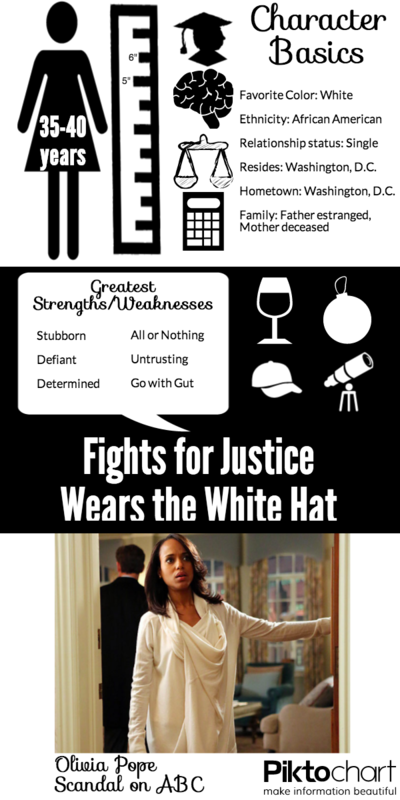 Good old Olivia Pope. Gotta to love her and Scandal. Excellent work on your infographic and character study, by the way. Thank you! Still need to have more fun with Piktochart and Canva. So much power there, but not enough time to dive in. I don’t know this character, but I love how you made the infogram. Looks awesome! The show is amazing! Earlier this year, one of my best friends got me started watching it. I binged on the first season from NetFlix, then caught up with the then current season 2 on Hulu. So good! By the creator of Grey’s Anatomy, it’s very well put together. If you can get it on NetFlix, I highly recommend!